C&IT weighs up the merits of two of the emirate's premier properties. Where is it? The wave-shaped luxury property is in Dubai's popular Jumeirah district, just 40 minutes from Dubai International Airport and close to sister properties The Madinat and the iconic Burj Al Arab. Event space: The striking dhow-like shape of this five-star hotel's conference centre is a fitting backdrop for all types of events. The Safinah ballroom can hold 900 delegates and is ideal for product launches, while the Meyana auditorium can host 416 for conferences. Other spaces include the outdoor Events Arena, where groups of up to 1,500 can revel under the shadow of the Burj, and the Beachcombers Garden for al fresco dinners for 100. AV: All function rooms are fully equipped with the latest AV equipment, including a media wall and satellite links for video-conferencing, plus wi-fi access is available throughout. Presentation equipment is on site and experts are on hand. Food and beverage options: With more than 20 restaurants, bars and lounges, Jumeirah Beach is ideal for the ultimate dine-around. 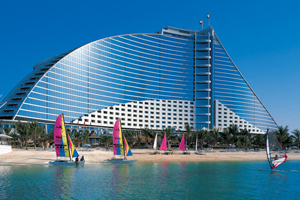 Accommodation: All 598 rooms have ocean views, with many overlooking the Burj Al Arab. A further 19 traditional Arabian beachside villas can host VIPs. Added value: Incentive planners can take their pick of activities and backdrops from the floodlit tennis courts, Pavilion Marina and Sports Club, five pools, golf driving nets and putting green, Padi Gold Palm and National Geographic Dive Centre plus 33,800m2 of private beach. But groups with big kids be warned - Wild Wadi Water Park may have delegates sneaking off. Day delegate rate: The day rate starts at £33 for meeting room, three coffee breaks and buffet lunch. Average room rates are approximately £296. Where is it? Set in the heart of Dubai's most upmarket shopping haunt, the Kempinski Hotel Mall of the Emirates is located on Sheikh Zayed Road, close to the business centre and the Internet and Media Cities. Event space: By far the most unusual backdrop is offered by Kempinski's Meetings on the Snow packages. Small brainstorm groups can hire one of the ski chalets, with their faux-Alpine view over Ski Dubai, one of the world's largest indoor ski slopes, and enjoy a meeting in the cosy cabin, with hot chocolate and other apres-ski goodies served in breaks. Other meeting spaces include 13 function rooms on the dedicated conference floor. AV: Built-in video-conferencing systems, wi-fi access and the latest LCD projection systems are on offer in the conference rooms. Food and beverage options: The property boasts an array of banqueting options including the poolside Mosaic Bar, the relaxed 24 Seven Italian eaterie and the ski slope-facing Aspen Cafe. However, for large groups seeking a dine-around experience, the 1,000-seat Sezzam features three kitchens: Steam, Bake and Flame. Accommodation: The hotel boasts 393 rooms and suites including 227 grand deluxe rooms, six duplex ski chalets for VIPs, and a 300m2 Presidential Suite. Added value: This is primarily a sleek business hotel, but incentive options include the neighbouring Ski Dome, K Wellness spa, golf at the neighbouring Emirates Golf Club and water-sports at sister property Kempinski Hotel Ajman. Day delegate rate: Rates are available upon request.